High Grove is an executive gated community in the heart of the Florida Orlando holiday experience. The villas are built in a Mediterranean style with the accommodation benefiting from a stucco finish and tile roofs. As well as Universal Studios and the Disney attractions, there are many golf courses within a short drive. High Grove is only 10 minutes from Disney and Kissimmee. Its location at the junction of the 192 and Highway 27 makes it easy to find. Orlando International Airport is 30 mins away and Sanford 45 mins. Our privately owned air conditioned villa has a king size, queen size and 2 twin bedrooms together with 3 bathrooms, a fully fitted kitchen (including laundry facilities), living room with sofa bed and double garage. Outside is a private pool with spa, set within a patio area where you can relax on sun loungers and chairs. 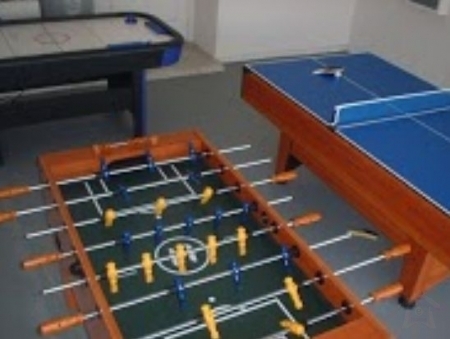 There is a games room with pool table, table tennis, air hockey and table football (Fusball). Guests may also make FREE local phone calls and FREE calls to UK landlines. Guests may also use the facilities of the nearby Bahama Bay complex. Situated on the banks of Lake Davenport, this Caribbean style resort has a large tropical pool, spa and fitness centre and cinema. There is also a fishing dock and sandy beach! This executive villa sleeps up to 8 plus an infant, it is fully air conditioned, and comprises of family room, large dining kitchen, four bedrooms all en-suite, two masters with en suite shower rooms, perfect for two families sharing, two twins which share an en-suite third bathroom, large screened furnished deck area with pool and spa/Jacuzzi (that may be heated when required at an extra cost). The family room is tastefully decorated and has high quality luxury furnishings. It also has a TV, DVD player, VCR, CD player, ideal for relaxing after a long day at the theme parks. Access to the pool and deck area is from the family room via an alarmed patio door, which has been installed with your children's safety in mind. Our spacious fully fitted dining room / kitchen has a large dining table and two bar stools at the breakfast bar. It offers every modern convenience, including full size cooker, dishwasher, microwave, fridge/freezer with ice making facilities, toaster, coffee maker, blender, kettle, a full range of table and glassware, double sinks with garbage disposal unit and spray attachment. Laundry facilities include washer, drier, ironing board, and iron. All bedrooms are furnished to the highest of standards and include remote control TV. There are two master bedrooms, one with a King size bed (6') the second with a Queen size (5'), built in robes, quality furniture with ample drawer space and en suite shower rooms with vanity unit, W.C, hairdryers and ceramic tiled floors. 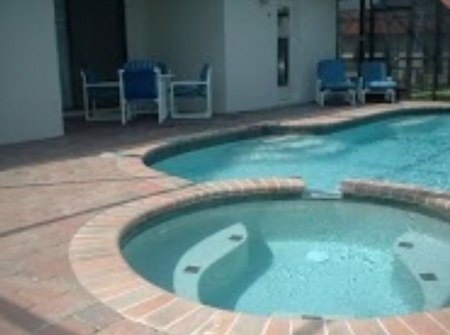 The pool/spa area has a paved pool deck with high quality furnishings consisting of a table 4 chairs and 4 sunbeds. There is a covered porch/lanai which offers shade from the Florida sun should you want it, the perfect setting for "al fresco" dining. All the doors and windows that lead onto the pool deck are alarmed to warn you if your children stray into the pool area unaccompanied. Pool/spa heating is recommended from October to April at an additional cost. Pool / SPA heating £75 per week if required, (Recommended October - April).